← The Worship Socks Are Pau! He Loves Them! They Fit! The suspense is over! I gave the socks to Raymond Wednesday night, after reading him what I’d posted on my last blog entry. I knew I’d be nervous and would forget what I really wanted to say if I didn’t read it. I handed him the wrapped package. By this time, of course, he knew what was in it. He opened it up, and immediately tried on the socks. And they fit! I could breathe! We took pictures after our small group was over for the evening. 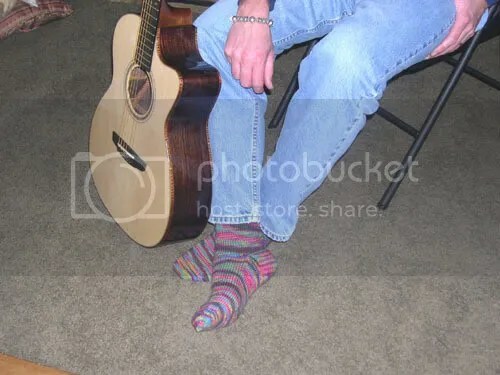 Raymond had a new, custom-made guitar and he wanted to take a photo of the socks with his guitar. Then he remembered that one of my special friends had made him a worship bracelet, and he wanted a photo of all three of them together. Mahalo nui loa ‘oukou [many thanks to all of you] for encouraging me along the way while I was knitting these special socks. I am grateful for each and every comment you all made. I appreciate the prayers and the positive thoughts. They are part of the gratitude that I feel for getting to be part of this whole process. The socks are pau [finished]. I am doing the happy dance! 7 Responses to He Loves Them! They Fit! Well you better start knitting some more for Xmas presents! OR donate a pair to Aloha World Gatherings…..you going? I going try try…. Raymond no get lu`au feets but! Can u imagine me knitting a pair for Lurkah? Anyway, I stay making sometin else foa him, u know, da kine. But that’s a good idea. Maybe I could make something else, yeah? For the Pacific NW Mini-Gathering. Like one prize thing. Drawing thing. I am so glad that it went well. I knew it would. What a beautiful guitar too. Blessed man. Hope your next project brings you as much inspiration. yea! they look like a perfect fit. What are you going to try to make next? I am so happy to hear AND SEE that they fit him!!!! Congratulations, Mokihana!! Your knitting is superb and I LOVE the colors. All are my favorite. I can’t wait to learn what you are going to accomplish next. Those socks are gorgeous – no wonder his wife wanted to borrow them. 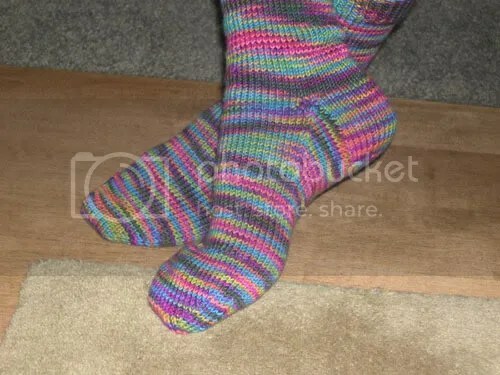 Makes me want to start a pair – although in the past I have knitted lots of things, I have never even tried socks, and at the moment I am doing little things for a new great-grandbaby. But I will! I’m on the first sleeve of Nolemana’s sweater… that’s what I’m working on now… I’m getting anxious to finish it. I’m working with dpn’s on the sleeve decreases now…..